The Sa Pa Rock Church was built in 1895 and it is the most ancient architectural work of the French left in Sa Pa, Lao Cai. 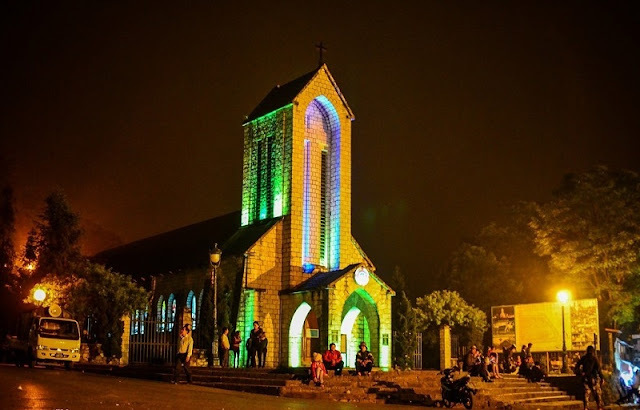 Sa Pa Cathedral is located in a prime location, shielded by Ham Rong Mountain on the back, facing a large, flat area, which is the home to colorful festivals of the mountain town. The cathedral is in the center of Sapa town, so it can be observed from the four sides, along with two other buildings built by the French – Chu Cau mansion (now the Hoang Lien Hotel) and the former district office (now the headquarters of the Lao Cai Tourist Information Center), forming a triangle with French distinct architecture style. The air of Sapa in the Christmas season is very distinctive and different from other regions in the country. In addition, the cold and hazy haze makes Sapa a shrinking European city when it enters the Christmas season. On this occasion, the restaurants, hotels in Cau May Street, Xuan Vien, Thach Son ... are splendid by the pine trees and pictures old man right at the door. With the splendor of the Sapa stone church and the electric lights bring warmth you will have a peaceful Christmas with the people of the parish stone Church Sapa to bring you on Christmas Eve. However, most notably, the splendor of the Sapa Daughter Church, visiting the church, will be the opportunity to participate in prayers at the same parishioners, and to capture warm Christmas pictures. 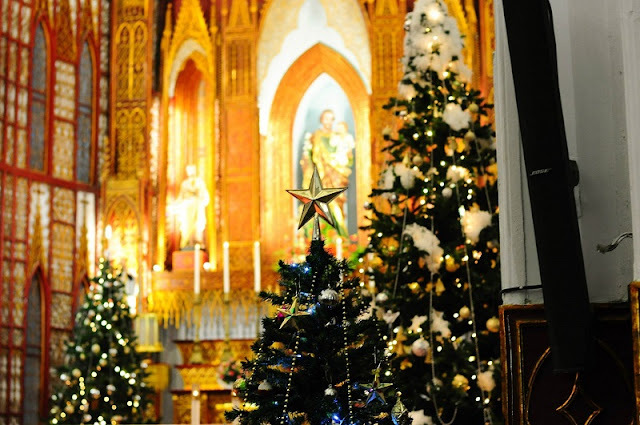 Leaving behind the noisy city, Sapa Stone Church will bring you an unforgettable Christmas atmosphere. Come to Sapa at Christmas, you can feel the mystery of this place is covered with white clouds scattered across the sky, leaving only the fragile light to pass through, creating a very own beauty of Sapa.